Thank you! I voted for you yesterday as well! Loved the gym powerhouse idea! At the bottom, doesn't it say max 1/user? Regardless, both of yours are great productions... funny too! Well I've added my entry. Like I said on my YouTube page, sorry for portrait orientation! It's also the First time I've tried making a video so it's not very pro I'm afraid! So yeah, mine is username funkin79 featuring my 18 month old son who is learning to walk and has only been doing do for a few weeks! My son (Evan) hopes to be in with a chance to win as he says he's low on nappies and nee-nees (what he calls dummy's/pacifiers)!! Ps I accidentally clicked the vote button and it took my vote? Is that an error?! 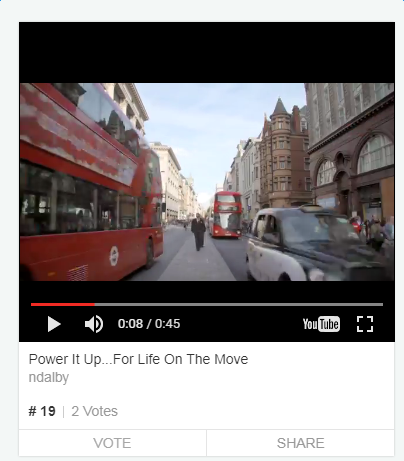 Surely we can't vote for our own videos? Could be a bug (there was one for single votes yesterday). I'm sure @AnkerOfficial will be checking the eventual winners and discounting if they've voted for their own and/or if the votes are just from their own account. Hope so! I won't be clicking it again. I hope others aren't gonna do it every day and their votes accepted! @ndalby, I saw you video on the page!!! Your editing skill is perfect hahaha! @benfoster42, Cute baby haha, thanks for attending this campaign, and you can vote for yourself! Never mind! Everyone who attend this video campaign, please don't be afraid to let us know! I think you did a great job. I wish I had messed about with this sort of thing before! I'm more of a photography person so this is brand new territory! I'd like to dabble more with video if there's a quick effective way to make something fairly slick. Closest thing I think I own is iMovie on the MBP but I haven't really used it or know if I can do much with it! @AnkerOfficial is there a limit to how many entries per person? Also, are entries containing other people's video/imagery taken from the internet permitted? Seen at least one purely made up of non original material. Well I'm guessing it is and it's high ranked. Just curious if original content is only permitted? Just wanted to check the above as the rules don't seem to cover this? Or is there a more in depth rule list? Also, are entries containing other people's video/imagery taken from the internet permitted? Seen at least one purely made up of non original material. Very good question...could be the same one I saw yesterday which was posted by a different user on YouTube over a year ago. It's just been edited down with captions added. Closest thing I think I own is iMovie on the MBP but I haven't really used it or know if I can do much with it! Thanks I'll have to check iMovie when I get the time! I've always been put off video making as it just seemed too involved and complicated! Maybe it's not as hard as I think it is! Sounds good, I'll definitely check it out. To be honest I've never had much need for video other than straight up recording so anything fancy hasn't really be required - still I'd like to give it a bash! Thanks again!